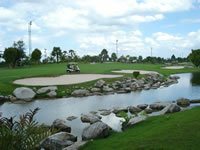 This course has a great variety of holes both in length and design. The pars 3�s are challenging with lengths of 193, 230, 206 and one short one of 136 yards. The par 5�s all measure over 500 yards and with the wind against you at times; these par holes can play like well over 600 yards!